Fitness World is a bespoke personal training studio specialising in unique, tailored programs based on the individual needs of the client. 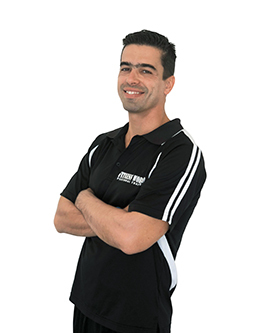 Each client is welcomed to Fitness World with a free, no obligation fitness consultation including a physical evaluation and a posture assessment prior to commencing any exercise program. At Fitness World, we offer all clients a welcoming, professional and specialised service each and every time they visit. At Fitness World, we recognise each client is different. We take the time to listen to our clients’ personal goals and based on their objectives, we develop an innovative program which we work on together to ensure their goals are achieved in a realistic, timely manner. When clients join Fitness World, they become part of our community and an extended member of the Fitness World family. Fitness World is located at Level 1/ 17 Tedder Ave, Main Beach, Gold Coast, in the heart of the thriving Tedder Avenue precinct. There is ample street parking available close to the gym and we are also located close to public transport (Main Beach tram stop is a 5-minute walk away). Since 2004 our personal trainers have been achieving transformation through a blend of know-how, experience, integrity and dedication. Fitness World are the healthy lifestyle specialists providing support, tailored training, a healthy eating plan, and evidence-based practice across the continuum of cardiovascular care.